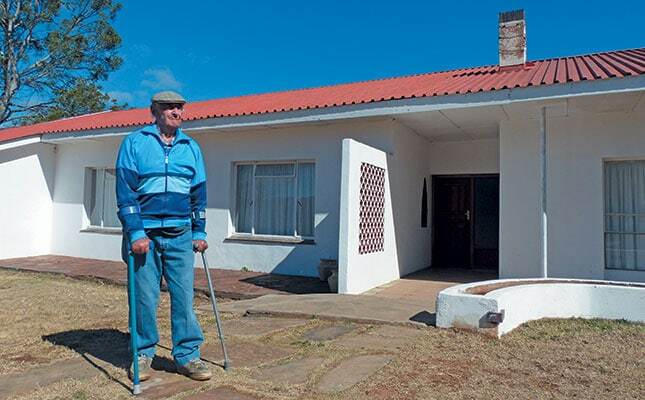 Neville is a Second World War veteran from Cathcart in the Eastern Cape who fought with distinction in the war, returned to play sport at a national level, and ultimately farmed on nine farms. His sons, Craig and Grant, are also farmers and continue the Fletcher family’s agricultural legacy. In 1862, Neville’s great- grandfather, Joseph, left Cuylerville near Bathurst in the Eastern Cape to build the military road between Cathcart and Queenstown on the Cape’s extreme Eastern Frontier. Not long afterwards, he settled on the isolated frontier farm, Dungella. Here, in rugged country, Neville’s grandfather, Walter, and later his father, Clayton, farmed cattle and goats. Neville travelled 38km a day on horseback to attend primary school in Tylden, and later went to Queen’s College in Queenstown. Many boys from the school enlisted in the Union Army, and Neville joined as a reservist in 1943 at the age of 17. After training in Potchefstroom, Neville was enlisted into the 723rd Artillery attached to the SA 6th Armoured Division and deployed to Egypt. On arrival in Cairo, he was disappointed to discover that it would take some time before he could enter the military action beyond the Mediterranean. Although reserved, as many soldiers are about their war experiences, Neville tells of the continual thumping of artillery as 100-pound (45kg) shells were lobbed into retreating enemy lines, the bitter cold of the snow-covered Apennines, liberated POWs in their striped pyjamas, and the tragic death of his friend, Robert Craig. When the war ended in 1945, Neville did not immediately return home. For months, he dealt with border control challenges, disease outbreaks and collecting abandoned ammunition – a job that nearly cost him his life. “We were picking up ammunition and the truck in front of us suddenly blew up,’’ he says. When Neville eventually returned to South Africa in late 1945, the war’s brutal memories lingered. But travelling overseas had broadened his horizons, and by the 1950s, he was back in Europe, this time as a professional tennis player in England. He stayed in England for six-month stints between 1950 and 1951, before returning permanently to South Africa. In 1956, he married Jeanie McEwan from Tarkastad and settled on the portion of Dungella he had inherited, which he renamed Mandalay in honour of the song, On the Road to Mandalay, one of the songs enjoyed by British soldiers during the war. As a result of the post-war wool boom, sheep had become a particularly important component of Neville’s livestock operation by the 1950s. “People didn’t like sheep here, but went for them because farmers in the Karoo did so well with wool in the 1950s,” he recalls. During the mid-1960s drought, Neville was employed at the department of agriculture’s bull station in Queenstown, an experience that convinced him to introduce Bonsmara bulls to his Afrikaner herd in 1968. His first four Bonsmara bulls, sourced from Vryburg in North West, were the foundation for his future pure-bred Bonsmara herd, for which fertility became a key selection criterion. It was, however, the extra income from wool that afforded Neville the financial flexibility to eventually purchase a total of nine farms in the Cathcart and Komga districts. He says, however, that Mandalay remained the most productive property he farmed. “Mandalay is where I made my money,’’ he says frankly. It’s not difficult to imagine his devastation, therefore, when the Nationalist government expropriated Mandalay in 1982 to be incorporated into the Transkei. The sudden move forced the family to relocate to Kirkwell, near Cathcart. After a land claims ruling in the late 1990s, Mandalay was eventually returned to the Fletcher family and is now farmed by Grant. According to Neville, the transition from ox to tractor after the war was slow. “People ploughed with tractors, but still harrowed with bullocks, because it was cheaper,’’ he recalls. Although he spent a large part of his time on a horse, Neville eventually realised the convenience of a cheap bakkie in the 1960s. “Mazda was the cheapest. I was never keen on smart cars. Cars were there to take me from one place to another,” he says. Neville was also an extraordinary sportsman. Not only did he play professional tennis in his youth, but in 1996 he lost the singles final of the SA Veterans’ Association Championship for over-70s. In the same year, he won the national doubles title for over-65s with Paul Sephton. Although he credits his mother for his love of tennis, he says that the game had once provided an excuse for socialising on the platteland. Another of Neville’s lifelong passions was gymkhana. He was a member of the Tylden Club, where the Fletcher family achieved celebrity-like status. The famous Tylden Dark Horse team consisted of Fletcher cousins Neville and Edgar, and Gerald and Raymond (Septimus John Fletcher’s sons). The team first competed in Stutterheim in 1946, where it won the sectional lance. Thereafter, the Fletchers dominated Border Gymkhana, winning the Geach Shield from 1953 to 1960. By 1964, they were the reigning South Africa Champion section. Neville also won the best-man-at-arms at the Border Gymkhana Championships from 1950 to 1954, and at the South African Championships in 1956 and 1958. He was also one of the three Fletchers to win the coveted SA Championship victor ludorum. Of course, an excellent horse was a critical component and Neville’s favourite was his stallion, Warlock, which was trained on Dungella while he was in Italy. Looking back, Neville Fletcher indeed has little cause for regret: here are memories aplenty to celebrate a life well-lived. Phone Neville Fletcher on 045 843 1008.